The global food and beverage (F&B) market has seen healthy growth over the last ten years and this is expected to continue. The proportion of comparison retail (clothing, footwear, white goods) as a percentage of total retail is decreasing and is being partially replaced by F&B, leisure and entertainment offerings in shopping malls, out-of-town retail parks and the main retail thoroughfares. This is being driven by changing consumer shopping habits and the growth of ‘experience retailing’, reflecting consumers’ desire to enhance their physical shopping experience with a social/leisure experience. This is being seen, not just in the more mature retail markets in the US and Europe, but also in fast growing emerging markets in Asia Pacific and Middle East & Africa. Consequently, new shopping centre developments, refurbishments and extensions are increasingly being designed to include F&B and lifestyle areas, including stand-alone food stalls and kiosks. By establishing and/or expanding the F&B footprint in retail schemes, it provides landlords with an opportunity to increase footfall, consumer dwell time and, ultimately, spend. This is particularly important considering the challenges faced by bricks and mortar retailers from the growth in online retailing in recent years in some markets. Most forecasters suggest that the share of online purchases will rise further, increasing the pressure on landlords and retailers to be flexible and to develop new strategies to create shopping experiences that cannot be replicated with purchases bought online, while also meeting consumers desire for convenience and speed. 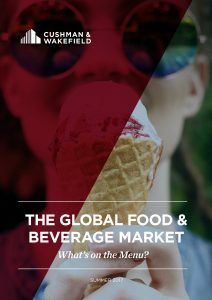 This report looks at key trends in the global F&B market, beginning with how consumer demands have been evolving and how retailers and shopping centre owners have responded to these changes. The report also provides an overview of the eating out markets in the key global regions, along with expenditure forecasts, in addition to summaries of prominent case studies. The report concludes with an outlook for the market and looks at some of the potential impacts of these trends on retail property.